I am sure that there is not a more diverse or global Board of Directors in the world today! Wednesday started with a blessing from the Africa Region. Rattan read something from the Sikh scripture, the Adi Granth, and Elisha told a story about being a tribal chieftain in Nigeria. I sat next to Swamini, who asked if I was doing better and suggested Reiki. When I told that Reiki and other magical approaches were the only ones that had helped, she said "Oh! Of course. You're a Wiccan. You're open to good things." I smiled and thought that would make a good slogan: "We're Wiccan; we're open to good things!" Sue, Becky Burad (Christian / USA - Treasurer), and Bill led a session on long-term sustainability. Bill told a story about another major, global interfaith organization that was already almost 70 years old when the URI got started. They didn't think that the URI would amount to much. Now, while they have a lot of global connections, they don't do very much because their funding can only support a staff of two. "Whatever we do," Bill said, "we'll need staff to support it, and funding to support the staff. If we don't have a President's Council to secure the funding, we could be in the same shape in the future." Bill talked more about the President's Council and its role in the URI. 1) Write a book about the beginnings of the URI (or else someone else would write it). That's just been accomplished. 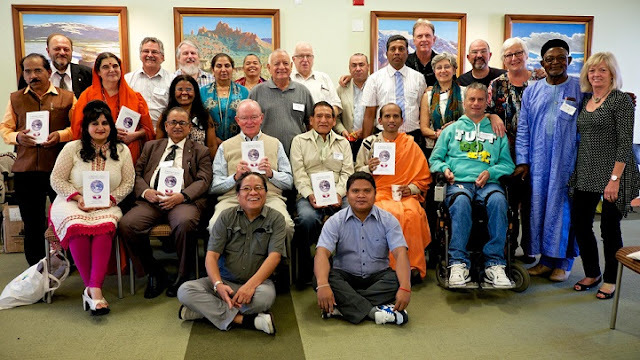 A Bishop's Quest: Founding a United Religions is available on Amazon. 2) Create an endowment to fund the basic operating costs of the URI. That probably needs to be ~$50-60 million and it's in the works. 2 1/2) Write a book called The Sacred and the Silly, collecting some of the ridiculous stories from his years as Bishop and URI founder. He has about 150 pages done. 2) The money being raised by the CCs themselves to support their activities. We did an assessment of this in 2000. If we excluded the handful of CCs whose own budgets were in the $100k to $1 million range, then the CCs were raising about 5 million on their own. 3) With a Staff of 26 people serving over 700,000 members, it was obvious that 90% of the work in the URI was being done by volunteers. Bill said that, with the growth of the URI since 2000, if we did an assessment today (which needs to be done!) of funds and in-kind donations circulating in the totality of the URI it could well reach half a billion dollars! 1) Self-sufficiency. The 745 CCs raise their own funds. This makes the URI unlike every other global interfaith organization. 3) Equity. We need to balance the value of money and labor so that everyone's contribution is honored. We also need to understand the relative value of a dollar in different parts of the world. I suggested that, rather than try to track currency exchange rates, we think in terms of the cost of something like a loaf of bread in different parts of the world. In the discussion of all of this, several people brought up the need to more clearly explain to prospective CCs the benefits of membership. I brought up our "What CoG Already Does for You" pamphlet and suggested that we include among the benefits of membership the opportunity to share in the vision of the URI and the opportunity to make a difference in the world at a larger scale through supporting the work of other CCs. When I interviewed 14 CCs in 2002 at the URI's Global Assembly in Rio de Janeiro, each of them explained how they raised money in very different ways in 14 countries around the world. In addition to their direct fund-raising activities, every single CC added how important it was to be part of a larger, global network - to be able to speak to donors with the gravitas lent by such a network and to know that they had the intangible support of hundreds of thousands of people who believed in and encouraged their work. When we had to cut short this discussion to move on in the agenda, Sally mentioned to me that in an open discussion, the white men always speak up first, giving them more input into the meeting before we have to cut it short. I added that it's always the white, native-English-speaking men. This is a cultural problem that we need to address. The fact is that we do have limited time to spend on a number of topics, so how can we make sure that voices that are not inclined to just jump in will always be included and heard? Becky said that all of the Trustees were very generous and that we should be proud. She reminded us of the traditions of giving in our various faith traditions. Sam An said that Interfaith Youth of Cambodia CC is not registered with the government, so it is illegal for it to receive donations. This is a problem in most of the world. It's not just an issue of being a non-profit and giving donors a tax-deduction, its that it is illegal for an organization to receive money from outside unless it is registered with the government, and registration can be a long and difficult process. Many countries' government are very suspicious of non-business organizations. Kiran agreed that the dynamics of giving are very different from place to place. In most of Europe, individuals do not give money to charities - governments do that. Currently, in the UK, there is a lot of concern re: violent extremism. If a group can sow that it is doing something to address that, then there is government funding available. Elisha talked about how CCs were able to work together to create a Christian / Muslim Tolerance Project that brought peace to an area of northern Uganda. I said that it's great that we can share stories of successful fundraising efforts here, but we need to share them across the URI network. Can we create a section of the global website dedicated to sharing information between CCs about successful fundraising, perhaps sorted by Region? There was interest in pursuing this when we are back home. Sue reminded us that the global organization does not receive support from corporations or religious groups. This has been a policy since the beginning, to avoid the appearance of undue influence. She, like many of us, believes that there are interested donors around the world; we just need to find them. 2. Accepting accountability for both the financial stability and the financial future of URI. 3. Approving URI’s annual budget, audit reports, and material business decisions; being informed of, and meeting all legal and fiduciary responsibilities. Becky explained that this was all about accountability. The Global Council is responsible for all resources and assets, management, insurance, employee benefits, outside audits, etc. 11. Collectively, GC Trustees will play an active role in fundraising for URI. Individually, Trustees will consider URI a giving priority and make annual gifts commensurate with their capacity. So that URI can credibly solicit contributions from donors, URI expects 100% of the Global Council to make some annual financial contribution. Sue explained that it's always very important to be able to say to a prospective donor that 100% of our Board contributes to the organization (whatever the individual amount). She said that the main reason that people don't give to a good cause is that they haven't been asked. She explained "planned giving". When Sue started to talk about the URI endowment, Sam asked for an explanation of "endowment" for the group. Victor did so, and Swamini added that this is often called a "corpus fund" in other parts of the world. Genivalda brought up an idea she had mentioned before called "$1 for URI". We should ask each CC for $1 - "although you can give more" - so everyone feels that they are participating in supporting the global URI. Also, imagine going to donors and being able to say "Do all of our Trustees give? Not only do they, all of our Cooperation Circles do as well!" 1) Corporations - We should approach those with a mandate to address social obligations. 2) Individuals - We should identify and approach those with a personal interest in using their money to support social good. 3) Earned Income / Goods - We should consider how the URI could become a global marketplace. 4) Government - We should identify sources of governmental funding. * Reach through our CCs to find people with funds. * Establish a Fundraising Resource CC in the Multiregion to investigate the different "cultures of giving" around the world and collect advisors knowledgeable in local fundraising to assist CCs. * Approach existing members better. * Get clarity re: who are we asking for? Global Operations? The Endowment? The Regions? Specific CCs? * Perhaps we should try to establish Regional Endowments? * Investigate the laws from country to country to ensure that the fundraising methods we recommend are in fact legal. What's legal in one country may not be in another. * Establish guidelines for building a case-by-case fundraising strategy. * Revive and circulate some of our earlier guidelines restricting funding from corporations or single-faith religious groups. * Develop a "message" of what the URI is and how it benefits corporations through the activities of its CCs and through creating a more stable social environment of goodwill and cooperation between religions. Let's face it - religions being at peace is good for business (well, most businesses). * Some sort of "stamp of approval" from the URI would help local groups approach corporations. * The URI could host a Global Marketplace where goods produced by CCs around the world could be sold. * We should encourage the CCs in the telling of stories. Almost all CCs have compelling stories of their founding, their challenges and successes, and more. Perhaps we could assist with getting such material published. * We could investigate employing our expertise to provide interfaith education in schools. * We could look into how goods could be exchanged between CCs. * It was noted that government grants are usually for particular projects. Concern was expressed that such funds may come with strings attached. * Some Trustees already work with USAID and have advice on writing grant requests. * Someone pointed out that, in explaining the amount of work put in by URI members, if each person's in kind work was valued at just $20 a year, that adds up to $14,000,000! Someone suggested that the Global Council should become self-funding. Another, that the CCs could participate hosting educational trips for donors. All of this just took us to lunch! Over lunch, I sat with Sherif, Elisha, Bart, Petar, and Elisabeth. We talked about the refugee problems coming from the Near East and the effect on Sherif's & Petar's countries (Egypt & Bulgaria). We also talked about the state of interest in secession in Elisabeth's Catalonia. * to create cultures of peace, justice, and healing for the Earth and all living beings. * Number of new CCs generated each year and geographic coverage of CCs. * Number & % increase in youth & women leading and participating in CCs. * % of CCs that partner with other CCs to carry out joint initiatives / activities. * % of CCs receiving support such as CC exchanges, trainings, participation in URI events to raise the CCs' profile. * Total number and % of CCs / people who have been trained in peacebuilding. * % of CCs sharing resources and information with one another. * Numbers of CCs linked to funders or resources. * Number and quality (scale of 1-5) of URI partnerships with institutions such as police, military, schools / universities. I've listed the above at some length for a reason. Early in the history of the URI, I pointed out - often and to anyone who would listen - that the structure of the URI and the structure of CoG were extremely similar. (So much so that, to this day, I keep slipping up and call their Global Assembly "Grand Council" or our National Board "the Global Council".) This should come as no surprise since the URI was trying to create a structure that would "allow for the maximum autonomy in the local unit, while providing for networking at the global level)". Where have we heard that before? This is why I chair the URI's Bylaws Committee - I am very familiar with these structures. Early on, they had a lot to learn from us. We'd tried the same things already and had discovered the pitfalls. After 15 years of experimenting at a global level with 745 local units, I sometimes think we can learn from them. Some things obviously don't apply, of course, and others have to be scaled down, but try reading the list above substituting "coven" for CCs and "CoG" for URI. Is there insight here for CoG's future? Could we be the URI of the Craft? Just food for thought. Where the analogy really breaks down, however, is in the activities of the CCs in their communities. The URI CCs are promoting interfaith in a way that covens usually do not. * Communities celebrate each other's religious and/or cultural holidays and events (through CC events). * Religious leaders engaged in dialogue (through CC events/activities). * Establishment of CC-sponsored interreligious councils to solve disputes. * Reduction of interreligious/intercultural violence (in community of a CC). * Number of children in schools with curricula and activities promoting interfaith harmony (CC-School initiatives). * Tolerance for building of religious shrines of minority religions (in CC community). * Media promotion of interfaith harmony (positive stories of interreligious cooperation, reduced use of stereotypes, voices of minority heard, etc.). * Children from different faiths/cultures play together. * Cleaner environment (through CC activities). Some of this still applies to covens, but would have to be re-interpreted intro a Craft / Pagan context. There's more, but this gets the idea across, I think. Maria added that w do a comprehensive interview with a CC when it joins, and another a year later, so we at least can see how much impact belonging to the network has had on a CC over the course of its first year. There was a LOT of discussion of this information - other indicators to consider, how to collect info about them, how to verify the perceived impact, etc. Liam reminded us to go look at the CC profiles on the URI website to learn more about what our CCs are doing around the world. I URGE everyone to go read a few of these. The work of CCs in Africa in particular is truly inspiring: http://www.uri.org/cooperation_circles/cooperation_circle_profiles I am very proud to be making whatever small contribution I am to facilitate the work of such CCs. During a short break, Bill said that he would be giving out and signing copies of his new book - A Bishop's Quest - at the back of the room. The book tells the story of the founding of the URI from Bill's point of view. Many of you may remember the struggle we had over the inclusion of "Earth" in the URI's purpose statement back at the founding of the organization. Bill's comments on the Preamble, Purpose, and Principles of the URI on pages 225-234 of this book shed some light on his understanding of these events and make interesting reading for Pagans. Whatever its history, the URI is completely supportive of environmental issues now and the Environmental Resources CC - founded by Bill Swing - was the first Resources CC to be created. When we reconvened, we opened with a blessing from the Southeast Asia & the Pacific Trustees - Musa, Peter, and Sam An. We then started the actual business meeting of the Global Council. Last year, when we first were given copies of the Essential URI Handbook, I noted that one of the "Key Principles of Good Practice for Individual Trustees" was #7 - "A Trustee keeps GC deliberations confidential." I asked how that applied to my reports and the ensuing discussion reached no conclusion. As a result, I errored on the side of caution and asked folks to look at my existing reports and see if they were okay. * Questions about how we would be proceeding with finalizing the Strategic Plan for the next few years. * A recommendation that, in the future, we have our meetings at the same place as our hotel rooms, to make it easier to grab catnaps. * We have a challenge in working on long-range tasks that will take several years when half of our Global Council is new every two years. We always have to start over to some degree. Staggered terms may have helped with continuity, but it has created other problems. * It's very difficult to find times for Global Council conference calls when we have folks in 13 time zones! Some of us are always having difficulty staying awake. * Several people talked about the miracles of getting us all together at all and of the work that we do in such a short time. * Bill noted that, in addition to our one face-to-face meeting each year, we have three conference calls. What if, for each of those calls, one Trustee from each Region was brought to San Francisco for a mini-face2face as well as the call? It could be a different set of Trustees each time, rotating through the Trustees from each Region. * Is there a way that the CCs could participate more in the work of the Global Council? * One of the non-English-speakers pointed out that they really need the face to face communication, as seeing the facial expressions is a big help in understanding the English. Victor said that he has been in very effective video conferencing and that this was something we could look into. * We will be going into elections in 2016 for four Regions: Latin America & the Caribbean, Middle East & North Africa, Multiregion, and North America. * Biff, on behalf of the President's Council who were with us, thanked the Global Council for the experience and for the work we do. We took a 10 minute break and took a group photo. After the break, we studied and passed a draft budget that will go back to the Finance & Operations Committee for tweaking as the year comes to an end, then come back to the GC for final approval at the end of the year. The projected 2016 budget at this point is a little over $3.4 million. Given the size of the organization, that's fairly lean and trim. Phil said that, based on his experience with other large non-profits, he was stunned that we were doing so much with so little. Victor said that he expected our budget to grow to around $4.5 million by 2020, given our current growth in CC membership. Phil asked how many of the Trustees do not have internet access? Just one. How many are on Skype? Almost all. How many are on facebook? Almost all. After this (and aware that our time was getting short), Victor and I gave a brief report on the status of our Bylaws Committee. We have partnered with the Mills Legal Clinic at Stanford Law School, which is taking on our Bylaws, pro bono, as a seminar project. They have all the reports from the Bylaws Committee so far and will go over our existing Bylaws - mindful of our needs and intentions, California non-profit law, and precedents of best-practices - and come back to us with a binder full of recommendations. Our Bylaws Committee will then go over those recommendations and report back to the Legal Clinic, which will then prepare a final report for our Global Council. Our existing Bylaws Committee includes: Kiran, Victor, John Weiser, John Kurakar, Genivalda, Vrajapati, and me as Chair. This concluded our business session and the official 2015 annual meeting of the Global Council. We had about an hour to relax and chat with munchies before the evening program. At 7pm a bus arrived full of members of the Board of Trustees of the Parliament of the World's Religions, many of who I recognized from previous interfaith events. Andras was there, but not Phyllis. She was busy preparing the Womens' Assembly that was starting the next day. Andras stood out as the only representative from a "non-Big 5" religion. We went around the room and everyone introduced themselves. In my opinion, the Parliament Trustees were surprised at the diversity - of both religion and nationality - of our Trustees. Later, over dinner, I think they were also surprised at the scope of the actions in the field of our Cooperation Circles - in conflict transformation, economic development, education, health care, nuclear disarmament, refugee and displacement issues, women’s empowerment., etc., etc. I think they thought we were just a bunch of dialogue groups. Just my impression. One of the conversations I had over dinner was with Suzanne Morgan (http://www.parliamentofreligions.org/programs/sacred-space-15). Back in 2004, I was one of the organizers of the first Interfaith Sacred Space Design Competition (www.interfaithdesign.org). The Parliament was one of the sponsors of the competition. Suzanne was the representative they sent to be one of the Jurors of the competition. The other conversation I had dinner was with Dr. Kusumita Pederson (http://www.parliamentofreligions.org/users/dr-kusumita-p-pedersen). We talked about the Spirituality & the Earth CC and the Lost & Endangered Religions Project (www.religionsproject.org). She was interested in the work we do in south India. Eventually, they caught their bus back and we caught our shuttles back to the hotel. And so ended a very long day of interfaith... and the Parliament would start the next morning!